Built in 1908, The Mount is full of original features and has great character, with large reception rooms off the central dining hall, wooden floors, open fires, and back servants' stairs. There are sea views from many of the rooms and the house is surrounded by a sunny garden that's a great spot to enjoy a game of croquet or badminton. There's ample space for a large group, as our floor plans show, but enough room to spread out and enjoy some personal time too. The dining room seats 12 comfortably for formal dinners, or up to 16 a little more cosily (and converts to a full-size pool table) and the kitchen is well equipped for catering for a large group. 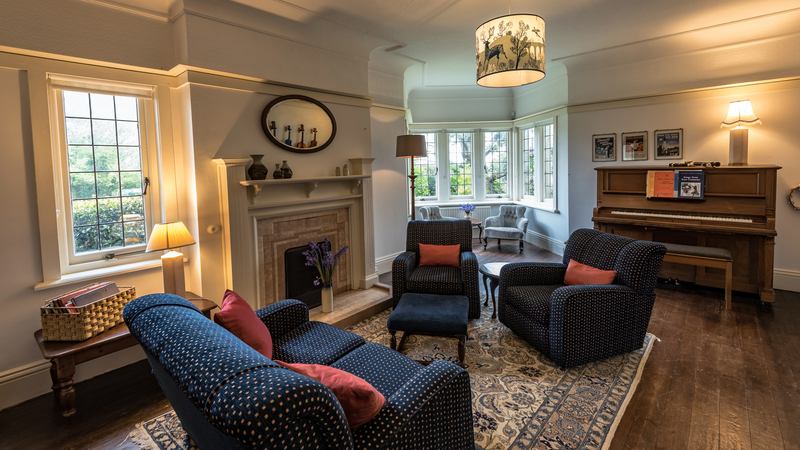 There are two living rooms, a lounge and a music room, ensuring the option of quiet space while other members of the group can play piano, ukelele or guitar. We supply lots of books, jigsaws and boardgames. There's WiFi, the TV has Netflix, while linked Sonos speakers in the reception rooms, with a Google Play account, mean your favourite music is instantly available to stream from the internet. Four of the six bedrooms have zip-link beds that can be set up as twin or queensize beds, and an additional 4ft sofa bed, 3ft trundle bed, Z-bed and travel cot are also available. There are toilets downstairs at each end of the house and upstairs are two family bathrooms and one en suite. We love dogs and are pleased to allow well behaved pets by prior arrangement.